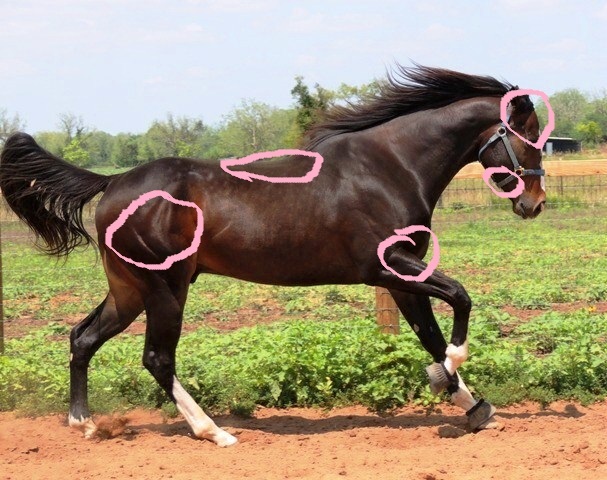 After all the high-tech, high dollar surgical intervention that has been done to get this OTTB back from an infection of the coffin bone, it is interesting that in addition to a change in shoeing, having my vet/chiropractor adjust Bruno has made more difference in his ride and movement than anything else. It is a little startling. 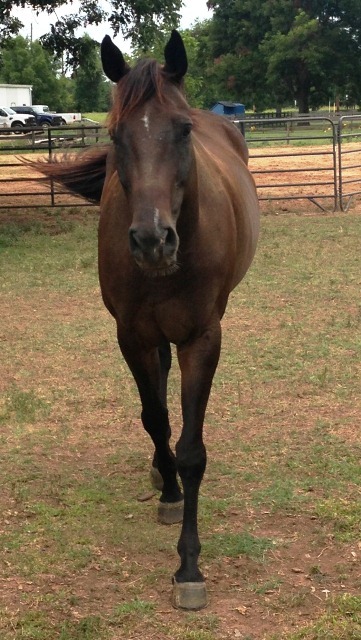 Eight months ago this Sunday, Bruno, a six year-old OTTB had surgery at Texas A&M Vet Hospital. At least a third of his hoof was removed including a portion of his diseased coffin bone. Then months of stall rest went by. Finally he was released to start back to work. But honestly, he wasn’t moving well. I expected him to be a little off with his hoof as the hoof walls continued to get stronger. But he was also moving stiffly in his hind end. It was a little disparaging to think you had won the battle with his foot but lost the war with him being sound throughout. We added injections to support his overall joint health. This week we had our vet, Lynn Criner, DVM, who is also certified as an animal chiropractor come out to look at Bruno (who of course she has seen many times, but never adjusted) and also our young mare Pixie. The picture above illustrates all the areas that Bruno had issues. Lauren said one of the most amazing adjustments, in terms of change, was in the space above his eye and below his ear. I had noticed one side seemed swollen-or had fluid. Also, it was difficult to bridle Bruno and not just because he is 17.2 hh. He did not like his head touched. Dr. Criner took his head in her hands, manipulated it and my head throwing, swollen faced horse was a thing of the past. He dropped his head down and sighed. Last night, for the very first time, he bridled easily and without issue. His hind end was out at the hip and spine. He was also out in the shoulder. All were returned to the normal position and again, the big horse sighed in relief. It might take a couple of times for this all to hold together, as muscle memory is long and Bruno has been in bad shape for a while but we will repeat as we need to do so. Last night when Lauren went out to ride, it was a different Bruno she rode. We have had problems trotting Bruno at all. He did not want to trot and we moved him into a canter early in each ride to keep him more comfortable. Last night, he trotted as well as he ever has, most notably was his nice, even pace and lack of a head tossing, tail swishing fight. He reminded me so much of my old horse Mac who is a hunter pro. Around he went, balanced and happy. When Lauren went on to the canter it was again the canter of hunter, as even and methodical as could be. 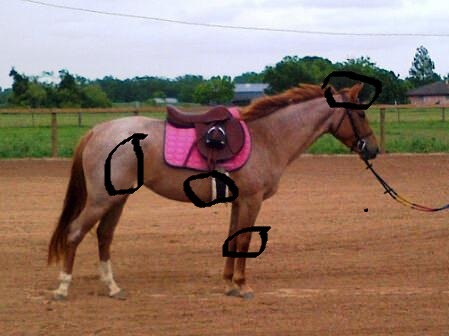 I even went so far as to say it looked like a hunter under saddle Quarter horse class. His head was down (okay not down that far! ), his hind end moved fluidly, and his cadence was perfect. It was a far cry from the usual off in gallop, dragging his hind end, missing his leads, horse of the past. I just hope this Bruno shows up again!! Pixie, the four year-old pony, has not liked us to tighten up her girth. She has been less than enthusiastic about me putting my leg on her and pushing her forward. In fact, she has been relcutant to really work at all. Well, that certainly began to make sense as Dr. Criner evaluated her. Pixie had ribs out of alignment on both sides, two on one side and one on the other. Can you imagine having someone draw a tight band around your ribs if they were out of place? Would not be a good time. I would not be very cooperative either. Her hips and top of her head (her poll) needed alignment and her little knees were sore (probably from bracing against the pain of everything above them). I had been lunging her more (to make her cooperate better under saddle) and that is the worst thing I could have done for her knees. The vet prescribed straight work for her, no twisting or turning as she starts to heal. Dr. Criner had suggested “ponying” Bruno down the hay roads so he could also work on the straight instead of having to turn over and over in the arena. Ponying is when one horse is being ridden and the second horse is brought along in a halter (seemingly under the control of the ponying horse). At the time, I told I did not have a horse to pony him with. Mickey is an all-star kicker. Feather would just panic and run away with him. Mr. Kid would want to run away with Bruno but might have a heart attack trying. When she suggested ponying Pixie, I started to give the same excuse-no pony horse available. Then it occured to me! Snowboy was coming home and if he hasn’t changed he will be an awesome horse to take Pixie down the hay road. Now, Snow ponying Bruno, first, what a sight that would be! Second, I wonder if Bruno could start running really fast and just pull me and Snow into air, like we were para-sailing behind him. Oh, I wish I could draw because I totally have a visual in my mind of the big, black horse dragging the fat, white pony and the old lady into the air! Horse show this weekend and hoping to be moving Feather up yet another division in height. I was nominated in June for a Liebster Award for new blogs. In turn, I had to nominate other blogs. Markthisday blog was one I nominated. I LOVE the response to all the Liebster questions and know you all will enjoy it as well! This is written by a 10 hand Shetland Pony (in the creative mind of award nominee anyway). I recommend her blog as one you will enjoy. This biped. What’s to be done with her?! She starts a blog about us (me, the biped’s Shetland pony, and my stablemate, her Arabian horse), but then fails to act when the blog is nominated for an award. That’s me, the biped’s pony, author of this guest post. I’m incredibly cute, despite my short legs. My mane and tail are blond (and yes, we do have more fun). My coat is gloriously gold, of varying hues, including red in the winter. I’m worth at least $300, because I can roll completely over on my back, from one side to the other, three times in succession (sometimes more). I weigh a svelte 350 pounds (or so the weight tape says). I stand 10 hands high (but my stature is without measure). I really, really, really like grass. Grass makes my hooves hurt really, really bad. What caused you to start blogging? This is my first blog post — I was compelled to write because my biped didn’t respond to your very kind nomination. What was the hardest thing you have ever walked away from? Oh man, that’s easy. The grass in the pasture, of course. What do you wish would change in your every day life? Well, of course, I’d prefer a REAL pasture instead a dry lot in the summer. If you review your blogs, what are you most passionate about? Like I say, this is my first post, so I’ll speak for my biped here — it seems she is most passionate about her equines (very natural, of course). If you had to start a new blog on a total different subject, or a specific subject what would it be? Boy, I could write a book about bipeds. What was the best moment of your life? When I was rescued from a violent and nasty biped. Where would you live if money and family were not an issue? Well, I’ve heard that the Shetland Islands are nice. If you could be a superior athlete, what would be your sport? Honey, I AM a superior athlete. What is one trait you wish you had more of that you don’t? Height. I’d like to be a horse. Then I could see over my stall door. What is one somewhat unique ability you have that most people don’t? Bipeds don’t eat grass, you know. If you had only five books to read (and re-read) for the rest of your life what would two of them be? “King of the Wind,” by Marguerite Henry (the Arabian insists this be in our library) and “Champion’s Story,” by Bob Champion and Jonathan Powell (I just love reading about Aldaniti, that gorgeous long-legged steeplechaser who won the Grand National). I DO want to say, on behalf of myself, my stablemate and our biped, that we really do appreciate being nominated. Thanks, exechorseluver! Joey sticking his tongue out at everyone! He says he found his way home-haha! OTTB Joey found his way home back to Caroline, from over 200 miles away, almost a month ago. Caroline had gotten Joey in pretty bad shape after he was rescued from a pasture in North Houston. She brought him along to be a well fed, well shod horse and trusted the world to take him from there. Joey, out to a new barn to begin an eventing career, had his feed cut back and his expensive shoes removed. By the time he got to a rescuer in Weatherford, Texas, he was in bad shape, again. His rescuer, doing some research found this blog, and helped get Joey back to Caroline. When he got off the trailer a month ago, he was badly crippled. He could not walk without pain on any of his feet. A trip to local vet, Buff Heldreth, DVM, diagnosed him with feet that had been cut too short. Days later, after a farrier visit, equipped with Equipak and new shoes, Joey started again. Day by day, Caroline has built up his rations, groomed his coat, and kept him sound. He just looks happy to walking soundly. While far from the gleaming specimen he was earlier this year (you can see other photos by clicking on the category “A Joey Story”), he definitely looks happy! I regularly read the OTTB Connect on Facebook, and day after day, there are ads for another OTTB for sale. For every great story someone has to tell, it seems someone else is having problems related to re-training, feeding, shoeing or some other issue. As one of my friends noted the other day, if the breeders are breeding for that one in a million horse, what happens to the 999,999 that aren’t that special one on the track? There are so many beautiful, talented OTTBs without anywhere to go. And the places they go may not be equipped to handle the training and care of these hot-blooded horses. While I am glad when I hear of someone taking on an OTTB as a project (there were three at our trainer’s alone this season), I am also concerned. The fees for these horses are low. Their pedigrees are from legends. Everyone (myself included) gets a little bit of savior complex. We are going to make this horse the best hunter, jumper, eventer or whatever! There is a lot of responsibility that comes with the mighty OTTB. So many of us are doing wonderful, admirable jobs of caring for them as long as our health, money and lives allow. It is the best we can do. Today, I am glad to see Joey one of the lucky ones who found his way back to great care and love. Thanks for riding along. 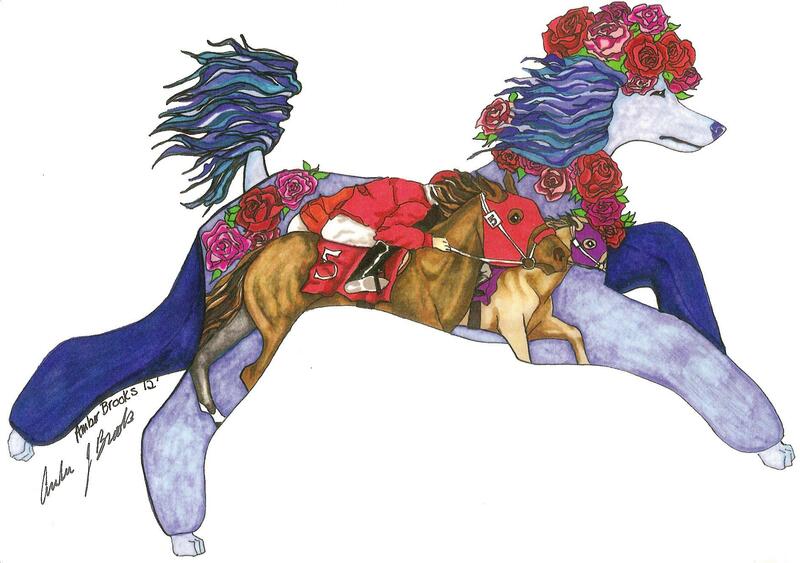 From the artist Amber Brooks comes a symbol of the loves of my life-animal anyway-with the Poodle and the thoroughbred. I just received the above watercolor drawing today. I LOVE it. It seems to sum up what is near and dear to my heart. What a talent this Georgia lady is. She owns poodles and horse like I. From a conversation on my office about how siblings have the same genetics yet turn out so uniquely, so can be true in the thoroughbred world. Thoroughbreds are (usually) thoughtfully bred to produce the best assets a breeder can give them through choice of sire, dam and the rest of the relatives as well. I have blogged before about Bruno (registered name-Fiddler’s Pilgrim) being well-bred with AP Indy, Seattle Slew, Secretariat and others. I just had never spent too much time looking at his dam’s side of the family. Today I glanced at the pedigree once again. I realized while his grand-sire on one side was AP Indy (pictures in blog further back) I had not noticed that his maternal grand-sire was Hansel. Hansel was a top horse as well-most would say greater than AP. 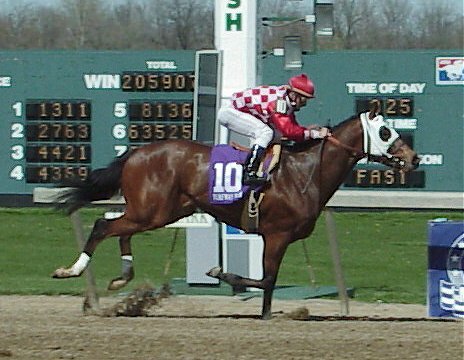 Winning two legs of the Triple Crown (the Preakness and Belmont) and many other big stake races. It was a little difficult to come to grips with such a prestigous horse with so many famous relatives, rolling in the mud at my little place in Wharton. Talk about a long way from New York. The fun of the OTTBs is their great heritage and lineage. Absolutely made my day. It is kind of like in the Disney movie, Secretariat, when jockey Ronnie has clearly won the Belmont race and his trainer yells, “Ronnie, don’t fall off”. Mickey jumping the infamous barrel jump. Set here at 3’6″. We got these metal jump cups that attach to the side of barrels. A lot of our friends, actually a lot of my friends all my life have been barrel racers. I have owned and run a top barrel horse in my youth. My arena will always have some barrels in it. When I found these jump cups that make my barrels into jump standards, I had to have them. A barrel is about three foot high. 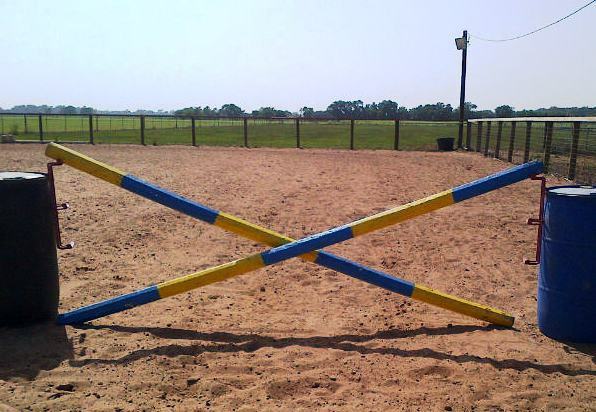 With the jump set on the top cup, with a regular pole, it is a solid 3’6″. With Mickey, we made it an oxer as well. Mickey was sailing over the jump, but he was an experienced jumper. Feather has not jumped the barrel jump before last night and not on the top setting. We took Bruno out to work and I was armed with my camera not wanting to miss a shot of Bruno finally jumping a fence. We started the barrel jump as an X. It was about two and half feet tall. Honestly, he could walk over it. I saw him trot towards it, move into a canter, easily jump and come back to Lauren (as opposed to running off strong). For OTTB Bruno, with his racer’s soul, it was something good to learn. That he has stayed sound as our work-outs have increased in intensity and now over the jumps is great as well. Lauren has never jumped Bruno over anything other than an X. I wanted to take the jump up to a vertical, which is really a horizontal pole across the width of the jump (don’t know why it is called a vertical but it is). Lauren said no. I set it up anyway. 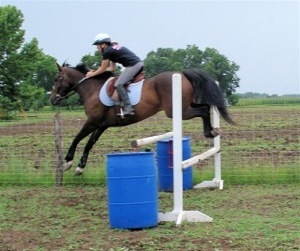 I will be first to admit his jump is not perfect, no nice even knees, he will hopefully continue to learn. The main point of the picture below and while I squealed with glee when I first saw it, is how Bruno makes this jump look like a toy. Ask any barrel racer, they will tell you they don’t mind racing around a barrel, but they sure would never consider jumping over one. While this jump is not the full height or width of one Mickey is jumping above, it still was the first balloon we have floated out there to see if Bruno might have the makings of a jumper. Lauren has never competed in a division with fences over 3’6″. 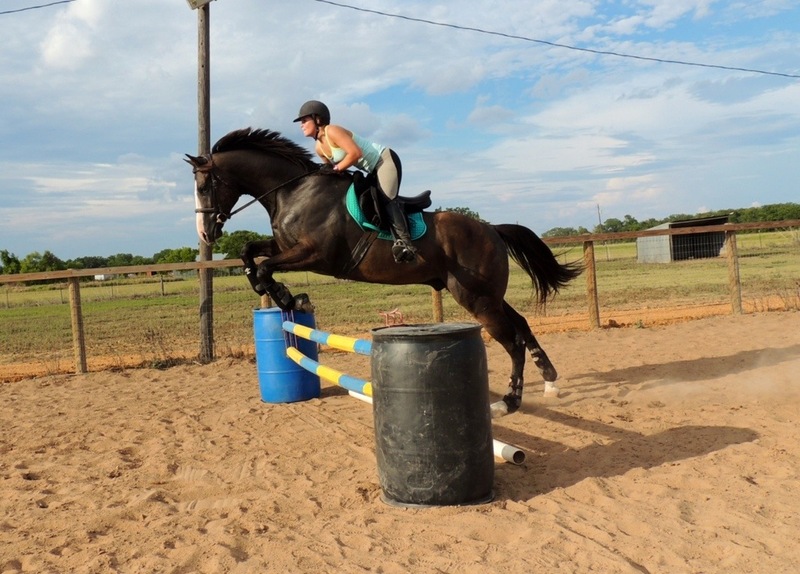 In this picture, Bruno’ s giant OTTB body, absolutely dwarfs the barrels. His back feet are still on the ground. His upper body is easily a foot over the top of the barrels. It was quite an ‘ah hah!’ moment for us. I quickly texted one of my friends to tell her the news. She told me she was excited to see where this Bruno story was going. Each of these small steps, takes closer and closer to having a show horse. We are going to take it slow but it is sure a lot more fun watching him jump than watching him stand in his stall! Pixie had a good solid ride. She seems to be maturing before our eyes. We got finished up with those two and Lauren saddled up Feather for workout. 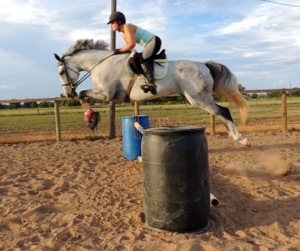 We don’t jump Feather much at home, preferring to save her legs for lessons and shows. But the barrel jump was calling to her. Again, not set up as high as Mickey jumped, Feather was her usual over-achiever self. Feather did a pretty good job of making those barrels look small as well. Maybe, we got a couple of sterling youngsters (three if you count Pixie) gaining ground and showing promise at our farm today. Getting Snow’s stall all set for his return! If you look carefully you can see the poodle’s reflection. As the hot summer days continue (no rain since Fourth of Ju-LIE-as my momma would say), the heat index has tipped over 100 each and every day, Lauren has been readying the barn for the Snow’s return. In some sort of manic phase of activity, Lauren has stripped the hay stall, cleaning out cob webs, moving hay, moving pallets from stall to stall, leveling the floor, adding dirt, adding rubber mats, and (are you ready for this?) changing out the gates herself. I was actually, shocked! More of her father’s genetic code must run through her system than what I thought. I did not even know that she could possibly take down on six-foot gate and replace it with a four-foot stall gate. We keep the hay locked behind higher walls and higher gates. So, Lauren had to remove the boards from the stall that will be Snow’s and then cut (with a saw) the boards to fit the new hay stall. I was just amazed. 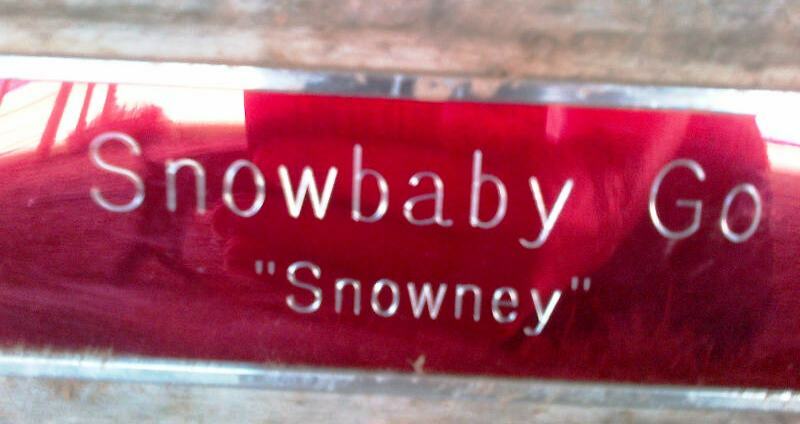 I think Jordyn is going to be thrilled when we surprise her with Snow’s return to Six Meadow Farm. The stall is not done yet, we have a fan to install, plywood to set in the back of the stall and of course, shavings. Dev suggested that next weekend when we have a horse show that Snow is attending, that we just take him home then. That will save an extra long trip to Dev’s to pick him up. We had planned to bring Jordyn down for a lesson on Labor day weekend and just, SURPRISE! Snow was home. Ally and her kids are headed to Denver to help Amber and kids celebrate their birthdays so Jordyn won’t even be in town when Snow gets here. Hopefully by the 21st or so, we can get the big surprise done. Meanwhile, I am continuing to work Pixie in hopes of turning her into an all-star hunter pony. She has been a little reluctant to work hard with heat. She has been getting extra time on the lunge line. I decided to try her over a small jump. She is young and never been jumped with a person on her back. She jumped the first time I asked and each time thereafter. We are going to get Dr. Criner out to check her alignment, back, and sternum. She does not like her back feet worked with and is still mareish when I tighten the girth. Not perfect, but her first jump in Texas. She was totally willing to do whatever I asked. DC will look at Bruno as well. We have scheduled Bruno’s first lesson at Dev’s. Lauren was telling farrier Roland last night as he marveled that Bruno still had his cast and shoe on, that she had ridden him eight times in the last ten days-and that was more rides than we had ever had since we have owned him. He seems to be getting physically stronger and easier to handle each time they ride. Roland was watching him last night as he finished up with the horses, “He really is a great looking horse, I hope he does great things”. Ditto, Roland, Ditto. Thank you for riding along. 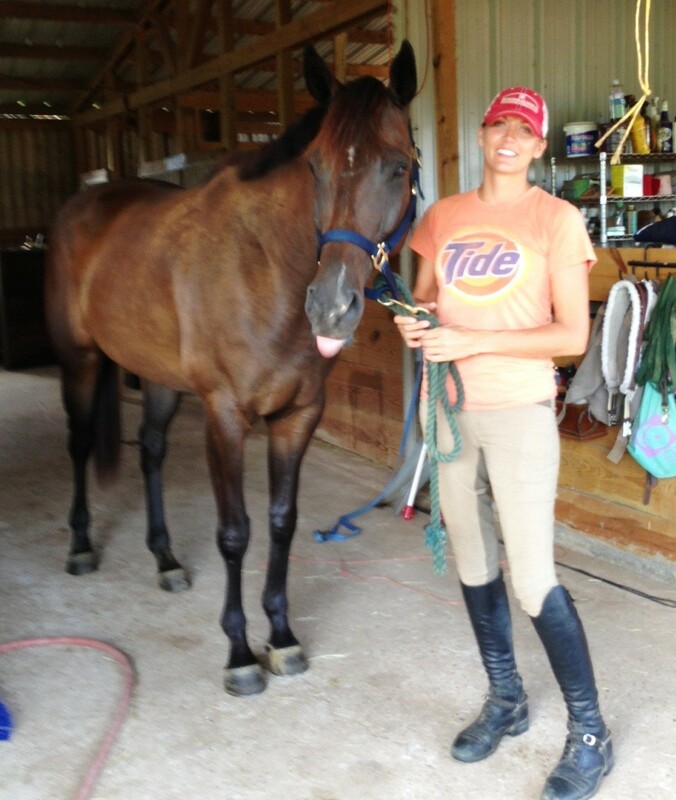 Going out right now (temp just dipped to a cool 99 degrees) to ride Pixie, Feather and Bruno. Good night to all of you! Two hundred and thirty-three days since OTTB Bruno underwent surgery to clear a long-time infection to his coffin bone, Lauren simply headed towards this X and Bruno jumped. Regular readers will know all the trials and issues we have endured trying to get Bruno back to sound. Five months in his stall, totally. Months confined to a small area. Boring days and critical accidents that we did not think Bruno would survive. But he has and since his shoeing (with a cast, straight bar shoe and equi-thane filler) a week ago last Saturday each day he has been moving a little better and with a less of a limp. We will need to do exercises to strengthen his hind end so he does not fall so hard on his forehand. Any dressage trainer anywhere near Wharton? But we can do that. It will take some time. Lauren usually works Feather in the morning. Then Bruno and Pixie are worked in the early evening. I have not been ready for her to ride Bruno when I am 100 miles away. But each day that he has been worked his attitude and mental state are better. Last night, Lauren wanted to ride Feather so she would have me there as she worked Feather through the jump grids assigned by Dev as homework. I had Pixie saddled. I wondered then what would happen when Bruno got to the ring and saw the jumps. Like a lot OTTB owners we don’t know a lot about his life before us. We can chronicle and even watch some race footage. But there are big gaps for us. Questions like why did such a big, well-bred colt start racing so late (at age 4)? Did he have hoof issues all along? 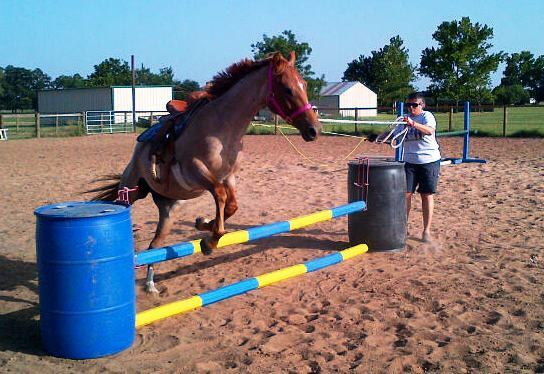 We know he came here to Texas to Sherre Sims, an excellent hunter-jumper rider and trainer. But we do not have details about what work she did with him. Has he ever been jumped through a course, if so how high? Lauren texted me early this morning that she was getting on Bruno. Just like I had with Pixie a few days ago, we set a time limit and if we have not heard from the rider within say an hour, it is time to dispatch the ambulance. We are out in an area without close neighbors (or at least neighbors would might even notice if we fell off) and we ride alone, a lot. I kept track of the time and saw Lauren’s call come in on my cell. I was scared-was she okay? She told me I would be mad at her-heart pounds faster. “Why what did you do?” “I jumped Bruno”. The rule is no jumping when you are riding alone. Still, instead of from fear my heart started to pound with excitement. “How did he do?” I wanted to know. She said they were just going through the paces, the X came up on the outside line. Lauren made a decision to jump. Bruno continued his even pace, rounded his back, jumped, landed athletically and continued to canter. So, he cantered. He spotted the X. He jumped the X. And he walked off sound! I will get some photos soon. Tonight all I have is photo of what the jump must have looked like to Bruno as he cantered up to it. Praise God!! It has been a long time coming. A new big chapter in the Bruno, My OTTB story has just started. Please keep riding along!